Earthy monotones, natural mineral counters and a new center island transformed this Milwaukee kitchen from common to classic. Rich quartzite slabs were handpicked for each counter to bring texture and passion to food prep. 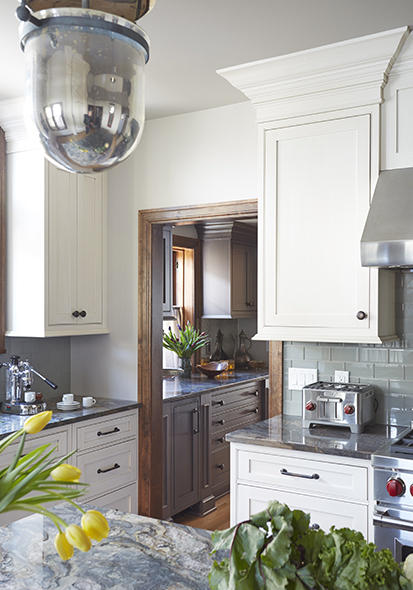 Mirrored glass bell lamps pay homage to the home’s 1920s bones and the rustic, living finishes on the cabinets’ hardware allow the kitchen to evolve with age. With a passion for cooking and entertaining, these newlyweds wanted their kitchen to reflect their home’s heritage while feeling expansive and welcoming. Whites and grays flow throughout the room, opening up the space and emphasizing the colors in the counters. The result is a warm, refined farmhouse style that caters to community and cuisine.